The Association for the Commercialization of Wild Mushrooms (ACPFNL) proposed the Requirements Specification: “Edible and Medicinal Wild Mushrooms of Quebec with Commercial Potential” in the spring of 2014. The ACPFNL has created a working tool that allows the whole industry to standardize its practices and ensure customers and the general population that marketed wild mushrooms are of certified quality that meets food safety standards. Buy this book. The Requirements Specification provides guidelines and detailed information about which species to harvest, handling the fragile product and marketing. 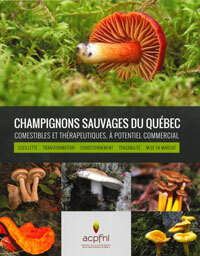 It also provides a wide range of photos illustrating quality grades of wild mushrooms in Quebec. A useful book for every user, from the amateur to the veteran.